We have launched our new webshop! Besides giving all employees the opportunity to go on a well-deserved holiday, we want to use part of our time this summer to work on new designs, books and other developments. That is the reason that we have decided to open the shop on Thursdays, Fridays and Saturdays only. After the summer our team will be ready for a sparkling new knitting season. 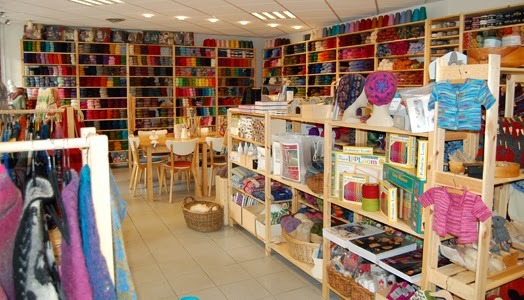 We are specialised in Scandinavian knitting and carry a wide variety of Norwegian and Swedish wool. We offer a huge selection of yarns, from cobweb lace to super chunky, in many colours. In addition to this we also sell Jamieson’s of Shetland with its more than 200 colours and the only spinnery on Shetland. Spinners and felters will find various fibres from Scandinavia, Shetland and Germany in our shop. Of course the designs of our team can be found in the books of our own publishing house, but also in kits and patterns. We also have a large range of refined and hand dyed yarns, like silk with seacell from Switzerland or mohair from South Africa. We think it’s important that the yarns we sell are manufactured with respect for people, nature, animals and environment. To learn more about the origins of our yarns we regularly travel to the factories where they are made. We want to know the road our yarns have travelled, from sheep to shop. Smaller and local companies are easier , friendlier and they often work a lot quicker. It makes knitting and crocheting a lot more personal too. Want to know more? We are happy to share our passion, so please come and visit our shop. It is also possible to order through email or by phone. Trollenwol means: an abundance of colour, yarn, of unique designs, books and advice and most of the time coffee or tea will be ready.